All Tilly's silver items over the weight of 7.78grams carry Tilly's Hallmark (known as the sponsors hallmark). For Tilly Mint Silver this hallmark is issued by the Birmingham Assay Office and ensures the purity of the silver. Tilly Mint Silver hallmark issued to larger items is a diamond with the initials JB found within the hallmarking on your piece. 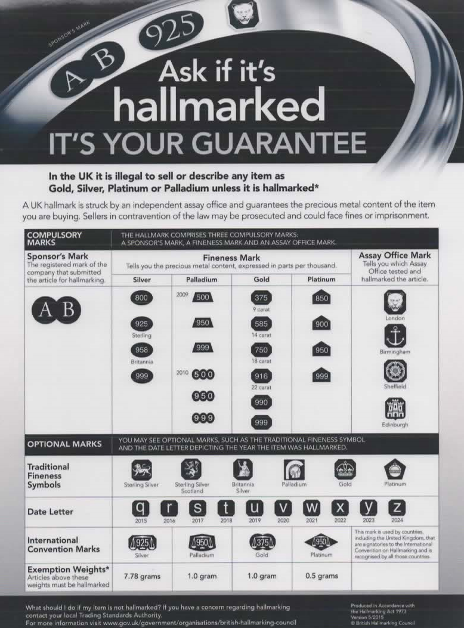 Most items under 7.78grams will not carry a hall mark, however if you would like a piece hallmarking please feel free to contact me for details. In the UK any Sterling or Fine Silver object over a weight of 7.78 grams that is to be offered for sale as Sterling Silver or Fine Silver must be stamped with the appropriate silver hallmark indicating the purity of the silver. A silver item weighing more 7.78 grams by law carries marks punched into the silver - known as Hallmarks. These marks indicate that the item has been tested for purity at an assay office and carries the mark of assay office where it was tested. Another mark indicates who the manufacturer or silversmith was that made that item. There can be other optional marks to indicate the date the item was made, and occasionally other information about the piece. In the UK the testing of silver objects and the marking of their purity is controlled by the National Assayer's Offices. The stamp indicating the purity of the silver is called the assayer's mark. The mark for silver meeting the sterling standard of purity is the Lion Passant, but there have been other variations over the years, most notably the mark indicating Britannia purity. The date mark is a letter indicating the exact year in which the piece was made, the typeface i.e. whether the letter is uppercase or lowercase, and even the shape inside which the letter is stamped all determine the year of making or manufacture. The city mark is used to indicate the city in which the piece was assayed, for example a crown of a certain style indicates the city of Sheffield, a lion indicates London, a castle indicates Edinburgh, while an anchor indicates the city of Birmingham. Each silver maker has his or her own unique maker's mark this hallmark is usually a set of initials inside an escutcheon. This website and its content is copyright of Tilly Mint Silver © Tilly Mint Silver 2017. All rights reserved.